I want to party all night! How long is too long? My wedding day is the most dreamed of and anticipated fun day of my life! Right? So I want to get the most out of that one day that I can. I want to party all night with everyone invited to my wedding and reception! But what is the reality and the time frame I need to expect? Most Christian or civil wedding ceremonies last 15-20 minutes unless there are special readings, music, etc. If there are pictures taken after the ceremony, then the reception and party begins about 30 minutes later. Most musicians will play for a maximum of 4 hours and photographers and videographers leave 3-4 hours after your ceremony. You begin to lose a good number of guests after the 2 1/2-3 hour time frame, leaving you with mostly wedding party and a few of your closest friends after that. While some couples choose a “fake” departure before the photographer leaves. this signals to guests that the party is finished. They tend to leave even if you go back in to continue your party. Planning your departure about 3 1/2-4 hours after the ceremony helps you to depart on an upbeat note and leaves your guests with the lingering impression that the celebration was special and fun, and they get to see the joy of you happily leaving to begin your new life as husband and wife. And that, along with a beautiful bride, a handsome groom and a great party will be the long remembered take away from your beautiful day! The fear of every bride who desires to get married outside is "what if it rains on my wedding day"? If it even begins to drizzle for a second, everyone is quick to offer the advice that rain is good luck on your wedding day. And if you're like most brides-that doesn't EVEN begin to make you feel any better! 1-Where is my dream ceremony site (probably the reason you chose this particular venue anyway.)? 2-In case of rain: does the venue have an adequate indoor facility that plan B can offer a beautiful ceremony setting as well? 3-Are the owners/manager willing to hold off until the 11th hour before moving the ceremony inside? Many venue managers want to move the ceremony inside based strictly on the weather forecast. 4-Do your guests have a place to duck under if an impromptu shower dumps its contents at the last minute? Or do they have to run into your beautifully set reception area-dripping all over your beautiful tables capes? At The Barn at Love Farms venue we are committed to making every effort to fulfill the wishes of our bridal couples. So rest assured that we will make every effort to accommodate your request for an outdoor ceremony if at all possible. Know that there is a certain amount of time necessary to "flip" the venue when plan B is necessary, but that time will be pushed back as long as possible when there is a chance that the rain will subside and the sun will return to shine on your exchange of vows outside of the Barn. In case of the need to move indoors-Your decorations will fit beautifully inside our Barn where you can still walk a long aisle from our Bridal Suite to your waiting groom as your guests enjoy the beauty of the moment. And our 1600 square foot porch provides shelter if your guests should need it-with lots of ceiling fans to dry those drizzles! Never settle for 2nd best and NEVER rely on luck! It is easy to get so excited over your new engagement that you want to share it with all of your girlfriends. And in the heat of the moment, you want ask everyone who is excited with you to stand up at the altar beside you. 1. Does she approve of your finance'-and this marriage? If she has not been your biggest supporter of this relationship; she might not be the best of the best buds to include on this path to the altar. 3. Will you be friends forever? Step back a moment and ask yourself if you will still be doing things together often, even if it's just chatting regularly in a year, or in 5 years? Will you really, REALLY be there for each other through the good years and the challenging days? 4. Can she afford all of the expense and responsibility that is necessary when being a bridesmaid? Giving a bridal shower, buying the dress, attending the bachelorette party, and buying the wedding gift can all add up. Some are so grateful to celebrate with you-without the obligatory purchases that go with being in the wedding party. All that being said. DO include those closest to you and those who will remain close and stand by you, not just on that beautiful day, but for years and years to come. And DO choose those who will make you laugh and help calm your nerves on the way to the altar-whether it's under a beautiful old oak tree or at the front of the cathedral. Wondering how to include beautiful fresh flowers without breaking your wedding budget? Here are a few suggestions based on what some of the budget savvy brides have done recently at The Barn at Love Farms. And take advantage of all of the flowers popping up as a result of the spring showers. Do: consult with a florist. Most good florists are happy to help you whittle down that initial flower bill with ways to include flowers for the ceremony venue and inside the barn - often using 1 beautiful arrangement for the ceremony, and then moving it inside to a focal table for the reception. They will help you to make your floral budget a reality. If they don't, consult another florist. Do: splurge on the bridal bouquet and, to a lesser degree, on the bridesmaids bouquets. These can also be placed in beautiful containers in a special place-like beside your guest book as friends enter to write a special wish (and remember to include enough space in whatever you use as a guest book so they can write a sentence or two of well wishes). Also, have the florist include at least one of your favorite flowers in your bouquet if they are in season. Flowers that aren't in season will cost more than those that are readily available. Don't: feel that you have to purchase all of your flowers from a single vendor. Many farmers' markets have beautiful blooms available. Check those markets, as well as grocery stores and wholesale clubs several months in advance to see what will be available in the season you say your marriage vows. If you can DIY a few blossoms into a glass vase, a small paint can from a hardware store, or even into a rustic Mason jar, then these will be very pretty sitting down the aisle and then on a few guest tables. Don't: assume that you need flowers on every table at the wedding reception. Use flowers on every other table and the room will still have that freshness and beauty that flowers offer. Do: Make use of the many decorations offered by venues such as The Barn at Love Farms for the other table and ceremony site decor. Lanterns, candles, vases and centerpiece holders go a long way in making your wedding unique. Do: Use lots of greenery. It can be a very budget friendly and beautiful accessory. Imagine lots of greens with just a flower or two added in. AND MOST OF ALL: DO Make it fit your own personality and enjoy your wedding day. Your memories will be beautiful! Did you know that most couples get engaged in November and December? So January and February are busy months at The Barn at Love Farms. Wedding couples are reserving barn wedding venue dates. As a result, most of fall 2018 is booked (we still have September 1 & 8 available). Most of our bridal couples are now booking into 2019. If you want a June, July or August wedding at The Barn at Love Farms, call us. We still have a few summer 2018 wedding ceremony and/or reception dates available. And inside The Barn we have adequate air conditioning! The Barn at Love Farms celebrates Love this Valentine's month with a few specials if you are desiring to be married within the next couple of months. 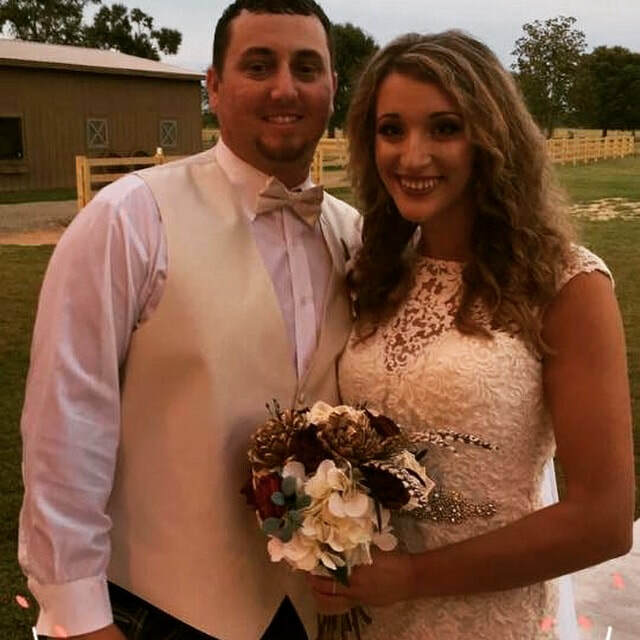 Don't hesitate to book your barn wedding venue first, as there are only a few outdoor wedding ceremony venues in the Mississippi Gulf Coast area. Call tel.228.493.0983 or contact us through our website at http://www.thebarnatlovefarms.com to come for a look and see all we have to offer for your wedding weekend. What a year we had in 2017!. In January, we were anxiously waiting for construction permitting for the Barn. And then, we could hardly wait for completion and for late summer and early fall when we would celebrate with some wonderful couples. August 5th came-our first wedding, and better yet, the marriage of our daughter. What a blessing! And in the following months we got to see so many families joined as two exchanged marriage vows, expected babies' parents were showered and a sweet family celebrated the birthday of a little one. Have you ever wondered why you couldn't get certain things you dreamed of to come about in your life in your own timing? Or why things you thought would please God just didn't work out like you wanted? We got to see God's work all through 2017 when many dreams, concerns and timing become reality at the Barn at Love Farms. The weddings, the people, the timing was all perfect. We are excited to welcome the Hancock-Harrison Cattleman's Association Board Members next Thursday, November 2nd at 6:30pm. Do you need a place to have your organization's meeting, Christmas party, shower or Birthday party? Call (228.493.0983), text or email us (thebarnatlovefarms@gmail.com)- or just fill out our contact form On our website. We will be happy to work with you for these on weekdays in addition to our hosting weddings and other large events on weekends. Looking for a place to get some awesome photos with Santa this year? Photographer Justin Daniels will be here Saturday, November 25th. Contact him for an appointment at 601.337.2461. What is "falling" at the Barn in October. Not the Bride and Not the Groom!!!. While this is the season for Autumn leaves to change color and fall to the ground in North Mississippi, the leaves are beautifully still on our trees in tropical South Mississippi. We still have plenty of leaves on the oak trees and beautiful grass on the ground for an October wedding. And the moderate temperatures make this month ideal for an outdoor wedding. And remember, the first week of October every year is Cruising' the Coast, when the vintage cars and trucks roll thru the Gulf Coast city streets. You can find them rolling or just sitting on display in just about every coast town from Bay St. Louis to Pascagoula. What a fun thing for your guests to do while waiting for time to get ready to watch you say your vows to your love. A 2018 wedding will be here before you know it--and we just may have found a new vintage auto for your favorite engagement and bridal portraits at Crusin' this year!!!. Wish us Luck!--We're wishing you lots of Love! ​The Barn at Love Farms. For many years, the cows at Love Farms had free range of property that is now a part of the Barn at Love Farms venue. They grazed on the sweet grass and rested from the warm sun under the big oak trees. But this year that all changed. Now, those big beautiful oak trees are settings for beautiful weddings outside of the Barn as twinkling candle light illuminate the trees from trapeze lanterns or an antique white chandelier. And that sweet grass, well, it's home to pews that hold misty eyed ladies and men as they watch the vows exchanged of a couple who are so in love. Well, last night the cows came home to the Barn and the ceremony area. Yep, I believe we just might have had a cow/bull marriage under the stars and the moonlight when we were all fast asleep. You see, someone (who shall remain nameless to protect the guilty) forgot to securely lock the gate to the pasture in a hasty trip to the stockyard. That left the cows who had been left behind with the prime opportunity to try out all of the new amenities that are The Barn at Love Farms. Very early this morning, the humans discovered that while no one was looking; the cows appeared to have had their own ceremony-and some even got into a tussle, trying to get the seat closest to the happy couple. It also appeared that they had a huge reception on the lawn, feasting on dew dipped grass, drinking from the lighted fountain and frolicking on the sprawling lawn. We humans are just left to our imaginations as to the fun and beauty of the starlit wedding of the cows at Love Farms. August 5th. The day we waited for. The day the youngest daughter had always dreamed of and the day of the first wedding at "the Barn". We watched and watched the weather apps for a couple of weeks and they consistently predicted a 60% chance of rain. Not a good day for an outdoor wedding-so they said. Clouds circled the farm all day-but no real rain!. What?!? No rain. That's right! No Rain. 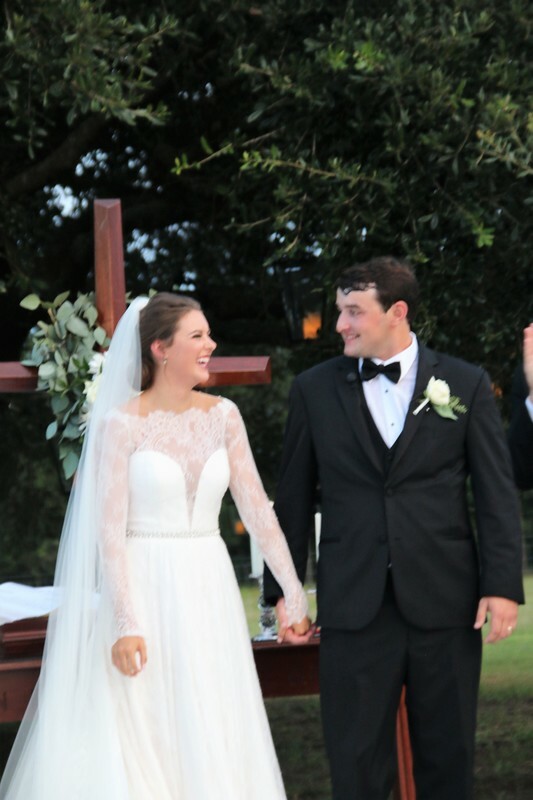 The first Bride and Groom got their dream wedding. Outside at the farm: in the New Barn at Love Farms. And it all went off without a glitch. Weather, a beautiful bride, a handsome groom, beautiful flowers, tasty foods and the best wedding guests ever! Many prayers were answered-or, as a wonderful friend said-God had it all planned: He just wanted us to stay close to Him and ask for His blessings on this couple and this new venue where the covenant of marriage that God ordained will be celebrated for many couples to come.